For other uses, see Recanati (disambiguation). Recanati (Italian pronunciation: [rekaˈnaːti]) is a town and comune in the Province of Macerata, in the Marche region of Italy. Recanati was founded around 1150 AD from three pre-existing castles. In 1290 it proclaimed itself an independent republic and, in the 15th century, was famous for its international fair. In March 1798 it was conquered by Napoleon Bonaparte. It is the hometown of the tenor Beniamino Gigli and the poet Giacomo Leopardi, which is why the town is known to some as "the city of poetry". It contains the Teatro Persiani named after Giuseppe Persiani an opera composer, born in 1799. 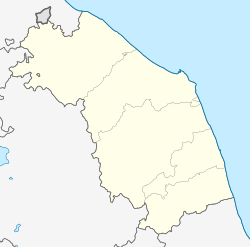 The origin of Recanati are unclear, although the area was inhabited since prehistoric times by the Piceni. In Roman times, the river Potenza, which was navigable then, saw the rise of two cities: Potentia, at the mouth, and Helvia Recina, located more inland. When the Goths led by Radagaisus ravaged the region around 406 AD, their inhabitants took refuge on the hills, perhaps founding the modern Recanati, which would take its name from Ricina. In the 12th century, during the controversies between Frederick Barbarossa and the Papacy, Recanati expelled the feudal counts which ruled its area, and gave itself a communal constitution under the lead of consuls (consoli). In 1203 they were replaced by podestà. In 1228, Recanati sided with Barbarossa's nephew, Frederick II, who again was in conflict with the popes; for this aid, the town was given the control of the nearby Adriatic shore, and the right to found a port (the modern Porto Recanati). In 1239, however, Recanati supported the pope, and the following year Gregory IX gave it the title of City and bishopric seat that had been previously held by the nearby Osimo. In the early 14th century, the strife between Guelphs and Ghibellines, which plagued much of Italy, also affected Recanati. In a series of incidents, citizens of Recanati, among the others, ravaged and plundered the cathedral, and later killed some Guelph (pro-papal) exponents. In response, in 1322, papal mercenaries besieged Recanati, and destroyed its fortifications, the main Ghibelline palaces, and the Priors' Palaces. By 1328, the Pope had pardoned the city; however, her seat as a bishopric was restored only in 1354. In 1415 Recanati hosted former Pope Gregory XII, who died here two years later. At the time, the town was home to a popular trading fair, which was further boosted by Pope Martin V in 1422. During several centuries of economic prosperity, Recanati became home to prominent jurists, writers, and artists such as Lorenzo Lotto and Guercino. Recanati was occupied by Napoleonic troops in 1798. In 1831 it took part to the Risorgimento riots, and was annexed to the newly formed Kingdom of Italy in 1860 after the dissolution of most of the Papal States. Santa Maria di Castelnuovo: 12th-century church with portal with a Byzantine style lunette, signed and dated 1253, depicting the Madonna enthroned with Sts Michael and Gabriel. The interior has a fresco by Pietro di Domenico of Montepulciano. Sant'Agostino: 13th century church and cloister, remade one century later together with the cathedral. Istrian stone portal by Giuliano da Maiano. In the 18th century, the interior was remade redecorated according to a design by Ferdinando Galli da Bibbiena, with canvases by Pomarancio, Pier Simone Fanelli, and Felice Damiani. San Vito church built over a pre-existing Romanesque-Byzantine edifice. It was given the current appearance in the mid-17th century, only the apse and the bell tower remaining of the former structure. The façade was remade after an earthquake in 1741 according to a design by Luigi Vanvitelli. Artworks in the interior include canvases by Pomarancio, Fanelli, Felice Damiano da Gubbio (1582), Giuseppe Valeriani (1550) and Paolo de Matteis (1727). Co-Cathedral of St. Flavian: 14th century church with the annexed bishop's palace and the diocesan museum. Pope Gregory XII is buried here. San Domenico: 15th century church with a 1481 portal by Giuliano da Maiano. It houses a fresco of the Glory of St. Vincent Ferrer by Lorenzo Lotto. San Pietrino: 14th century church with an 18th-century façade attributed to Vanvitelli. Palazzo Venieri, designed by Giuliano da Maiano. Palazzo Mazzagalli, designed by Giuliano da Maiano or Luciano Laurana. Montefiore Castle: dates to the late Middle Ages. It has a polygonal plan with a high tower with merlons. Neolithic necropolises of Fontenoce and Cava Kock (4th millennium BC). Civic Museum of Villa Colloredo Mels: town museum of art and archeology, among the paintings it houses among other paintings, Lotto's Recanati Polyptych. The city of Recanati had a fairly large Jewish population for hundreds of years. Among the scholars produced by the city were Rabbi Menachem Recanati (1223–90), author of the kabbalistic work The Reasons of the Mitzvot. He was a student of Rabbi Eleazar Rokeiach from Worms, Germany, who was one of the Chassidei Ashkenaz, a group of German pietists. His work, Sefer HaRokeiach, is a guide to ethics and halacha. He wrote a mystical commentary on the Torah. Rabbi Elazar Rokeiach was also the teacher of Nachmanides, whom Rabbi Recanati quotes frequently in his work. Last names have been derived from and changed to Recanati, e.g., Agostino Recanati. Descendants of the Jews in town settled in Salonica, where Leon Yehuda Recanati, Raphael Recanati and Avraham Rakanti where born. The family also includes Michael Recanati and Leon Recanati. ^ Diego Calcagni (1711), Memorie istoriche della città di Recanati nella Marca d'Ancona, page 290. ^ Diego Calcagni (1711), Memorie istoriche della città di Recanati nella Marca d'Ancona, p. 293. ^ Diego Calcagni (1711), Memorie istoriche della città di Recanati nella Marca d'Ancona, page 294. Wikimedia Commons has media related to Recanati.